The application is open until November 1, 2016. Gravity, as the weakest of all the fundamental forces, is also the least well tested. A successful classical theory, Einstein’s theory runs into numerous difficulties when quantum effects are considered. Just as the classical theory has passed all tests so far, and the actual detection of one of its most important predictions, gravitational waves nears reality, it is nevertheless an incomplete theory unreconciled to quantum principles and the also spectacularly verified Standard Model of particle physics. Modifications of General Relativity are almost certainly necessary at ultrashort distance scales. On the one hand this new physics at ultrashort scales may be imprinted on cosmological scales by the exponential expansion of inflation. On the other hand, the detection of dark energy today and its possible origin as quantum zero-point energy of the vacuum raises questions about our understanding even of the long distance, or infrared properties of a quantum theory incorporating gravity. The reconciling of gravitation theory with quantum principles is arguably the most profound question in theoretical physics at this time. 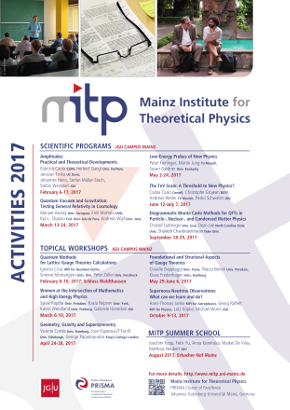 Building upon successful experience with Topical Workshop at MITP in June 2015, this Scientific Program will bring together theorists from particle physics and general relativity with observational cosmologists to develop new approaches to these outstanding problems and new collaborations to confront theoretical ideas with the wealth of observational data that is now becoming available.